Hello there friends and crafty peeps! 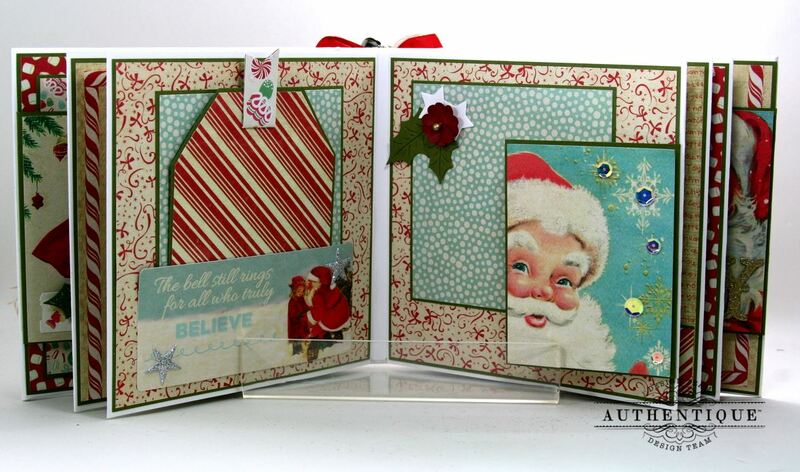 It’s my day to share the project I created to participate with the Authentique Team Christmas in July series. 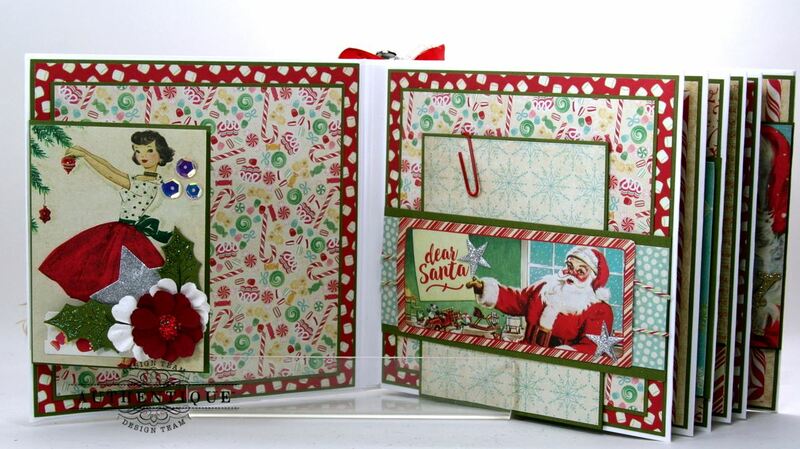 I’ve been celebrating that all month on my blog so I was eager and ready to jump in with this mini scrapbook album I created with the new Jingle collection. I can’t help but to love this collection. 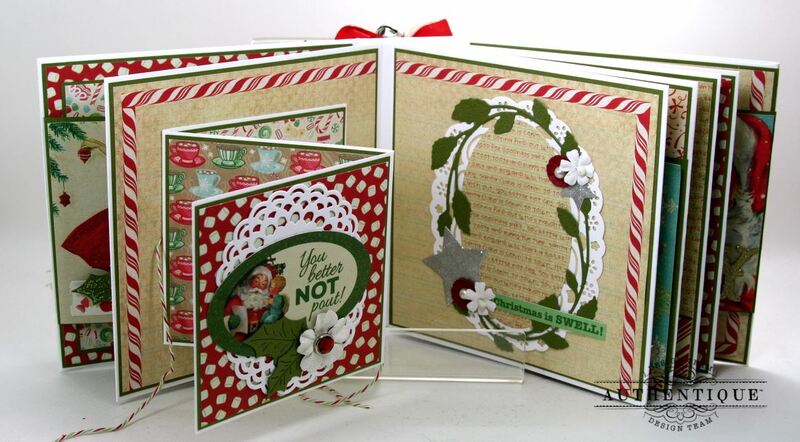 It’s retro and vintagy and has amazing patterns and fun holiday images! And it layers like a dream! I’ve used green cardstock matting throughout the book for a consistent look and to keep the pattern mash ups from looking too busy. Tip ins and belly bands are a must with minis so you can maximize the real estate for pictures and journaling. 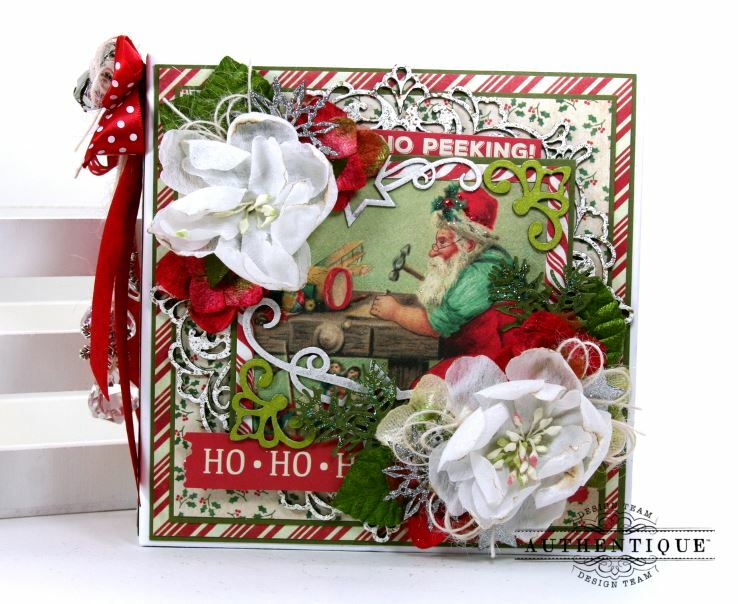 Adding die cuts and flowers and twine is a great way to incorporate embellishments. 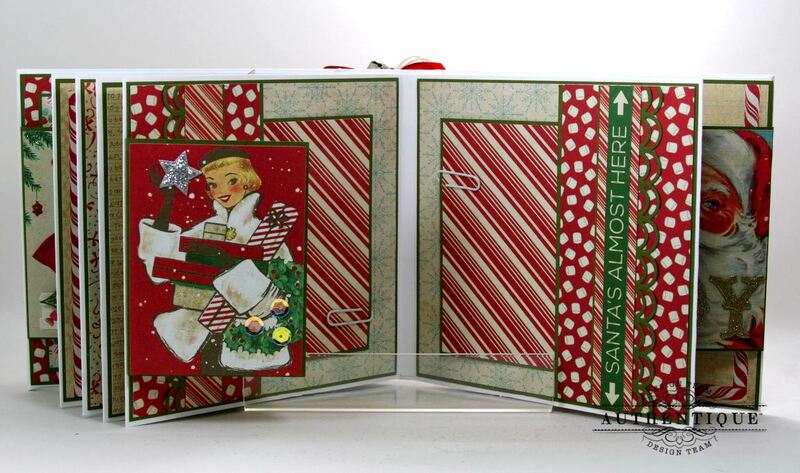 This set of pages has an accordion fold element finished with the companion papers. The images on the die cut sheet make perfect pockets! Why not tuck in a tag or some flat mementos like tickets. The page on the left has a large banner shaped tip in that folds in from the top. It’s decked out with a die cut doily, embossed stars, flowers, and holly. The right side has a lovely photo mat that’s raised and bordered with a pretty die cut frame. More pockets is always better especially when filled with tags. 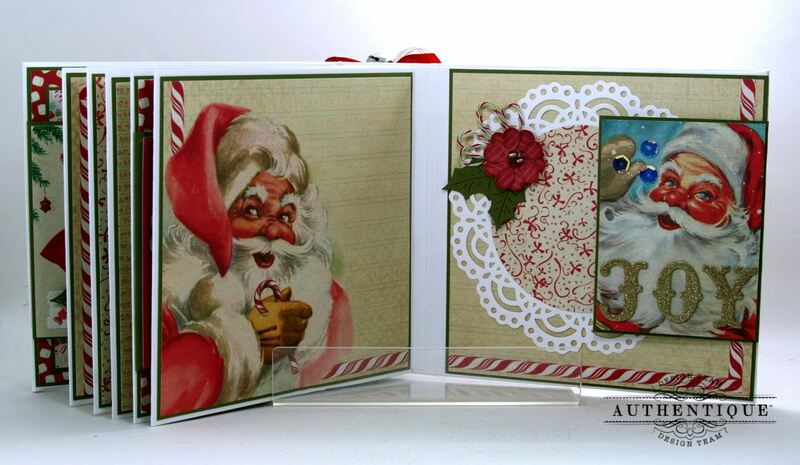 The last set of pages have a large Santa image with lined pattern behind just perfect for writing in all those special memories. 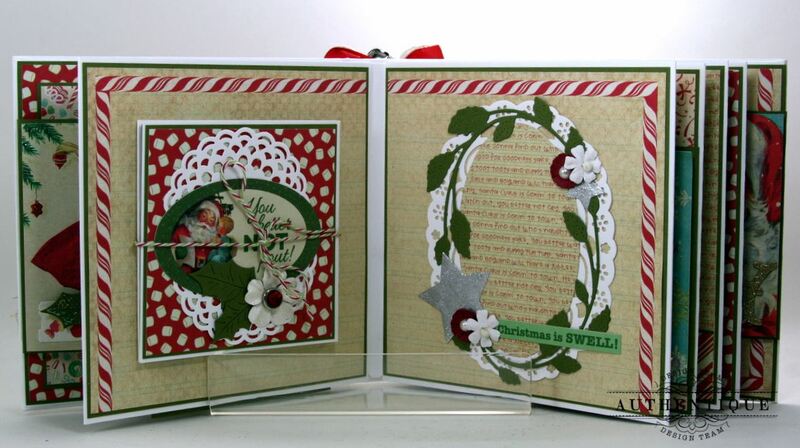 Pretty glitter chipboard stickers spell out a festive holiday sentiment and add a bit of sparkle. Tiny handmade flowers with holly and a loopy bow of baker’s twine is a swet and simple way to finish off this layout. Jingle Collection: 12 x 12 One, Three,Four,Five,Six,Seven,Eight. 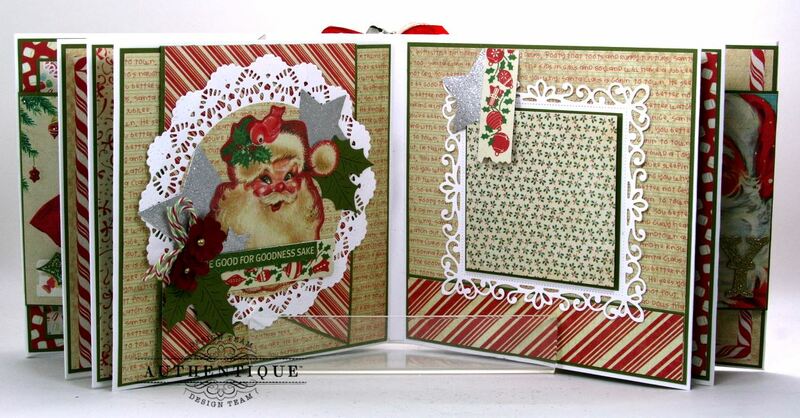 6 x 6 Paper Pad, 12 x 12 Elements Cardstock Die-Cuts. Gypsy Soul Laser Cuts~Deco Frame, Petal Corners, Stars Flourishes and Borders, Snowflake Shape Set. Really Reasonable Ribbon~Red Satin Swiss Dot, Ivory Burlap String. What album was used for this project? Did you make it and if so how? thanks! I thought Jingle was great when I first saw it but your creation makes it over the TOP and a must have! I am so enjoying your Christmas creations, thank you.